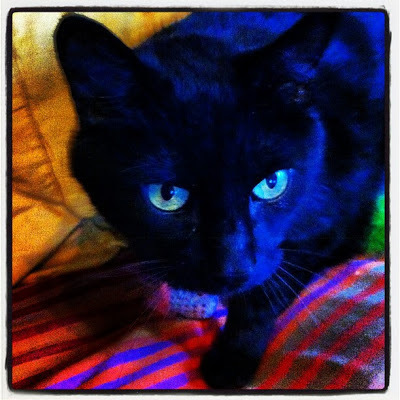 I recently joined a new blogging group called the Pass the Cook Book Club. The idea is to pull out those dusty cookbooks and discover some new recipes that may have been overlooked. Although I've been better about using my giant cookbook collection since joining Eat Your Books, I'm still up for any opportunity to use them more. This month, we cooked burgers from Bobby Flay's Burgers, Fries, and Shakes, and these burgers were seriously amazing! I've made the basic burgers from this cookbook (which were fantastic), but had never tried some of the more creative flavor combinations like this Greek burger. 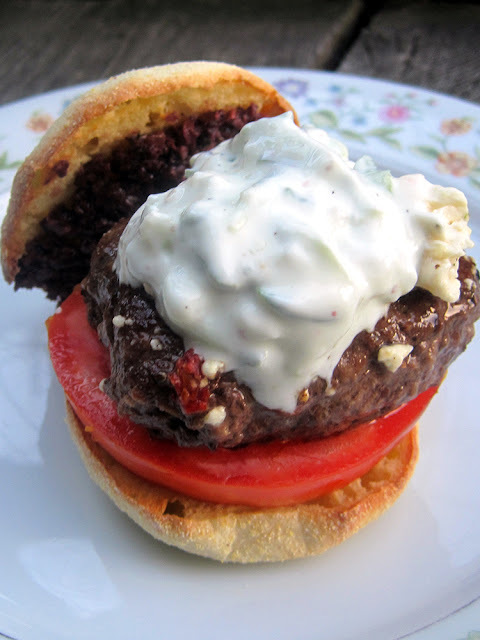 The burger is paired with juicy, fresh tomatoes; a tangy yogurt-cucumber sauce; a brine-y olive spread; and melted feta cheese. Wow! I usually can't resist adding ketchup to any burger, but this one totally did not need it. All the flavors combined perfectly to create a super-flavorful burger. My only misstep here was to sub in English muffins for the burger buns - I was sick of buying packages of eight buns and only managing to use four of them, but the English muffins didn't quite work here - I'd stick to regular buns next time unless you're willing to eat this with a knife and fork! 1. Stir together the yogurt, cucumber, and garlic in a small bowl. Season generously with salt and pepper. Set aside while you prepare the rest of the meal. 2. Combine the olives, thyme, and olive oil in a food processor and process until the olives are finely chopped. Set aside. 3. Divide the meat into four equal portions and pat each into a thin patty. Season both sides with salt and pepper. 4. Heat a skillet over medium-high heat. Rub oil onto the skillet, and then add the burgers. Cook until they're almost done to your liking, and then add the cheese and cover with a lid for about a minute. 5. Place a toasted English muffin half on each plate, and then build your burgers: a thick slice of tomato, a burger, and a generous spoonful of yogurt sauce. Spread the top half of each English muffin with the olive paste, and then top the burgers. Serve hot! 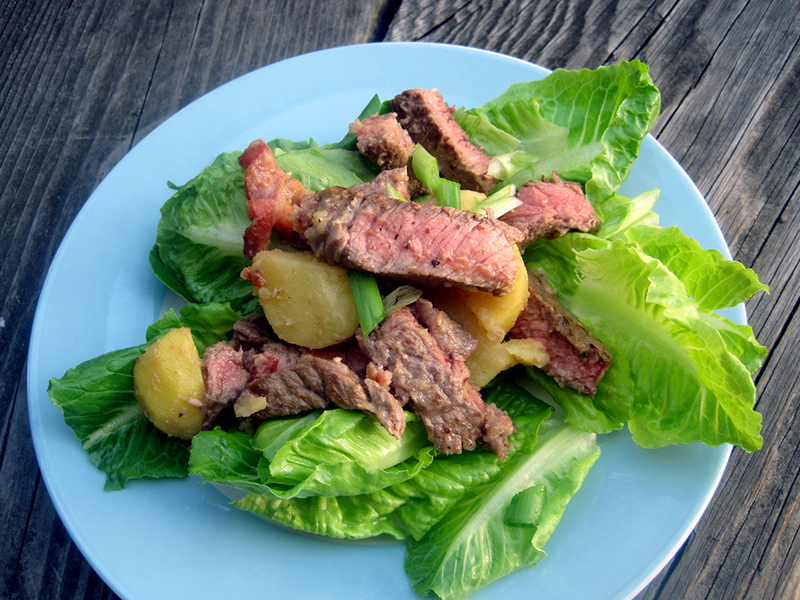 Steak, potatoes, and salad...how can you go wrong? Well, ultimately I liked this recipe, but it didn't 'wow' me. All of the components were tasty enough, but they didn't quite come together into a unified dish. The steak and potatoes made a nice salad, and the dressing was very tasty - you can't really go wrong with a dressing based on bacon fat. But, it felt a little disjointed from the greens, like it was a warm potato salad just stuck on lettuce - that said, it's not a bad way to eat your vegetables. :) Granted, I didn't use tenderloin as specified in the original recipe, because there's no way I would spend that much money on a weeknight recipe or just to slice up in a salad! If I'm going to buy expensive steak, I'm going to eat it as a steak, and probably for a special occasion. Overall, this was a yummy dinner but probably not something I'd make again in its current form. Next time, I'd probably skip the bacon (which was good, but sort of over the top), and instead toss the potatoes and steak with a simple vinaigrette, high on the acid to cut through the richness. Then, I'd do a Caesar salad sans-croutons underneath to bring in that creamy element and, well, because I love Caesar salad dressing. With a few tweaks, I do think the idea of a steak-and-potatoes salad is a fun one that could be very successful. 1. Bring a large pot of water to a boil. Add the potatoes, along with a generous pinch of salt. Reduce heat, and simmer 12-15 minutes, until the potatoes are tender. Drain and set aside. 2. Meanwhile, heat a medium skillet over medium high heat. Add the olive oil to the pan and swirl to coat. Season the steak with salt and pepper. Once the oil is hot, add the steaks. Cook until it's as done as you like (will depend on the thickness of the steak and how you like it cooked). Remove from the pan, cover with foil, and let sit until ready to use. 3. Turn off the heat, wipe out the skillet, and then return to medium heat. Cook the bacon until crisp, and then transfer to a paper towel-lined plate. 4. Pour off all the bacon fat from the pan except about 1-1/2 T. Add a pinch of salt, a few grinds of pepper, and the flour. Cook 30 seconds, stirring constantly. Whisk in the vinegar, 3 T water, sugar, and mustard. Cook for a minute or so, until slightly thickened. 5. Pour the sauce over the potatoes. Then thinly slice the steak, against the grain, and add to the potatoes. Crumble the bacon, and add to the potatoes and steak. Toss everything together. 6. Arrange the lettuce on plates. Top each plate with a scoop of the potato-steak salad. Sprinkle with the green onions and serve. 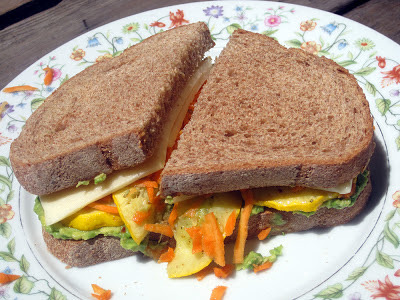 These sandwiches were inspired by our CSA box - when I saw all the yummy vegetables inside, I knew I wanted to combine them all in a vegetarian sandwich! This is a perfect sandwich for a summer afternoon...sweet summer squash, crunchy carrots, and creamy avocado make the perfect fillings for hearty whole wheat bread. You can leave off the cheese to make this vegan, if you prefer, or add it on for extra flavor. Either way, you'll be in vegetable heaven! 1. Preheat the oven to 400 degrees. Line a large baking sheet with foil. Brush the squash slices with oil, and then arrange on the foil-lined baking sheet. Sprinkle with the seasoning salt. Roast, flipping once, until the squash is browned and tender. 2. Meanwhile, mash up the avocado and mix it with the lime juice and salt. 3. When the squash is roasted and the bread is toasted, assemble the sandwiches. Divide the avocado mixture in half, and spread on two slices of bread. Layer with the slices of squash. Layer on the grated carrot, and then top with the Fontina cheese. Top with the remaining bread slices. Cut each sandwich in half, and serve. Are you ready for the weekend? I sure am! And this breakfast is definitely the perfect way to celebrate a lazy Saturday or Sunday morning. It comes together really quickly, so you're not spending all morning in the kitchen, but it still feels special and fun. I love Dutch babies, but I don't think I've had one since college. After eating this one and reminding myself how tasty they are, they're definitely going to go back into the weekend brunch rotation! It's basically a giant, puffy pancake that's baked in the oven. Dutch babies can be topped with pretty much anything you like - powdered sugar and lemon juice is traditional, but here I went for regular sugar and diced fruit. 1. Preheat the oven to 350 degrees and place a 9x9 square baking dish into the oven. 2. Measure out the milk and flour in separate bowls. 3. In a medium bowl, whisk the egg until fluffy. Add the milk, flour, vanilla, and salt, and beat for one minute. 4. Remove the baking dish from the oven and add the butter. When the butter is melted, quickly pour in the batter and immediately return to the oven. 5. Bake until the pancake is puffed and golden, 10-12 minutes. 6. 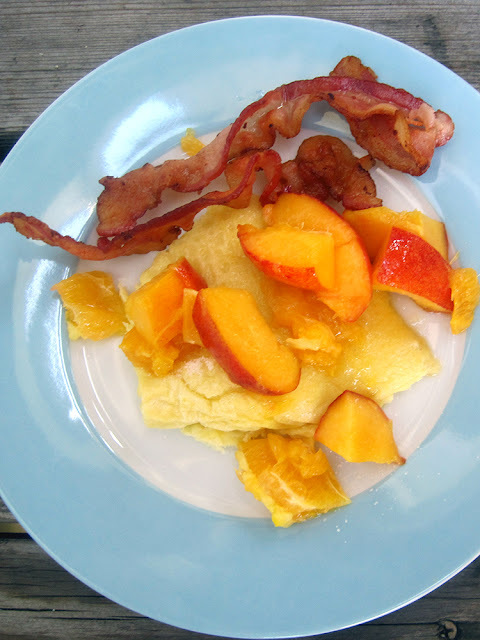 While the pancake is baking, slice the nectarine into chunks and place in a bowl. Cut the peel off the oranges, and then cut the oranges into chunks, removing large pieces of pith and any seeds. Add to the nectarine, along with any juice. 7. To serve, cut the pancake into quarters. Sprinkle each piece of pancake with a little sugar, and then top with the fruit. Stone fruit season, how I love you! There's nothing better than a perfectly ripe and juicy nectarine, peach, or apricot. 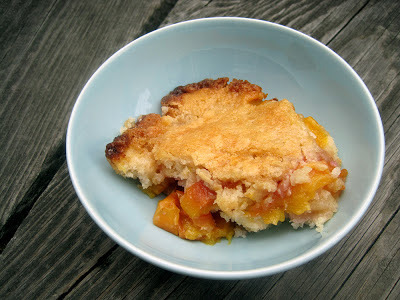 This cobbler is the perfect way to enjoy an abundance of stone fruit. The method for putting it together is simple but a little strange! The bottom of the baking pan is filled with melted butter, and the batter is poured on top - without mixing. Then, you add tons of sliced nectarines - way more than it seems like you need. However, by the time this strange combination comes out of the oven, it's been magically transformed into a delicious cobbler! The batter rises to the top to create a tender, sweet crust on top of the perfectly juicy fruit. This cobbler is best warm, but if you end up with leftovers, they'll stash in the fridge just fine. 2. Melt the butter, and then pour it into a 9-inch square baking dish. 3. In a medium bowl, whisk together the sugar, flour, baking powder, cinnamon, and nutmeg. Add the milk, and whisk to combine. Pour into the baking dish on top of the butter. Do not stir! 4. Add the fruit on top of the batter, again without mixing. It will seem like too much fruit, but it will turn out perfectly! Just try to get it as even as possible. 6. Bake 40-45 minutes, until the top is golden brown. Tim and I recently saw an ad on TV for some really awful-sounding bacon-topped pizza. I can't remember the details of the ad, but it did inspire a conversation about what a really delicious bacon pizza would taste like! I eventually came up with this combination - extra crispy bacon, sweet corn cut right off the cob, creamy goat cheese, and thinly sliced scallions for a little kick. There are a couple of tips here that will make this pizza as good as possible. First, you definitely want to buy thin-cut bacon so that it will get crisp and easy to crumble. Make sure to blot off excess fat with a paper towel before crumbling the bacon so that it doesn't make the pizza greasy. Second, this is definitely not a time to pull out the frozen or canned corn. There are many recipes where less-than-fresh corn will be perfectly fine, but the corn here is really the star of the pizza, so make this one during sweet corn season. Of course, you can use any pizza crust recipe you like here - including the pre-mixed dough in the refrigerator section - but this crust is so easy that you might as well make it yourself! When I saw that Biz from Bizzy in the Kitchen had posted a recipe for no-rise pizza dough, I knew I wanted to try it out. The dough comes together really easily, and is wet enough that I think you could easily mix it with your hands if you don't have a stand mixer. Then, you just let it sit while prepping your toppings, pat it out on a baking sheet, and pre-bake for a few minutes to make sure the crust gets fully cooked by the time the toppings are done. Simple and delicious! Edited to Add: I've made this pizza quite a few times since this post, and am totally in love with it. It's also terrific with pesto, chopped bell peppers, and/or prosciutto in place of the bacon. 1. Preheat the oven as hot as it will get. Line a large baking sheet with foil, and spray with oil. 2. Combine all the crust ingredients in the bowl of a stand mixer, and mix on low speed with the dough hook for a few minutes. 3. Let the dough sit while you prep your topping ingredients. 4. Using wet hands, transfer the dough to the prepared baking sheet and gently press it out as thinly as possible. You may need to let it rest for a few minutes when you're halfway done to allow the gluten to relax. Make sure to use wet hands when handling to dough so that you don't tear it. 5. Cook the pizza dough for about 5 minutes, until the top is dry but not browned. 6. Brush the entire pizza crust with a thin layer of olive oil, and season with salt. 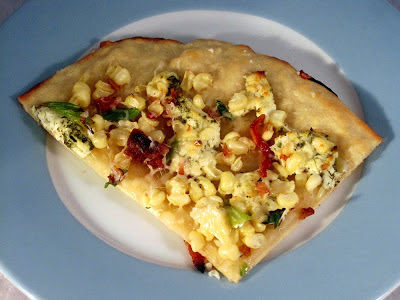 Scatter the corn, crumbled bacon, crumbled goat cheese, and scallions evenly over the pizza. 7. Return the pizza to the oven, and bake until the crust is nicely browned. 8. Right when the pizza comes out of the oven, grate some Parmesan cheese all over the top. I was recently sent a copy of Austrian Desserts to review, and I had Tim pick out the first recipe to try - a cake full of fresh oranges and slathered in milk chocolate frosting. First, though, my general impressions of this cookbook. On the one hand, this cookbook is not for beginners - the recipes don't include a lot of guidelines as to how the batter should look at various stages, there are often unusual ingredients that you'll have to search out or substitute, and details like pan sizes are not always included. That said, the recipes are really unique and different from what you'll find in an American cookbook. So, if you want to try out a new dessert cuisine and you're willing and able to do a little tinkering to get the recipes right, I think this cookbook would be a good choice. 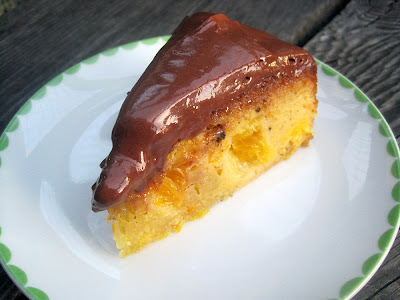 So, how was this orange cake? Interesting is the best way I could describe it - it was definitely tasty, and we had no problem finishing it all, but I don't know if I'd make it again, at least as written. The recipe contains lots of eggs and very little flour, and not too surprisingly, that means it baked up into something that was sort of a cross between a cake and a sweet omelette. I would have preferred a more tender crumb, but the inclusion of lots of fresh oranges was great - they were juicy and really flavorful. The frosting was also a little off - it was super creamy and chocolate-y, but contained too much alcohol. I will absolutely be making this frosting again because it was easy and really delicious before adding the Cointreau, but I'd start with maybe a tablespoon of liqueur and add more to taste. 1. Preheat the oven to 325 degrees and butter an 8-inch springform pan. 2. Place the marzipan in a food processor and pulse until it is finely ground. Add the water, eggs, and confectioner’s sugar and pulse until combined. 3. In a large bowl, whisk together the flour, cornstarch, sugar, baking powder, ground vanilla, and salt. Add the marzipan mixture and carefully fold in. 4. Drizzle in the butter, and sprinkle the orange zest over the batter. Gently fold until combined. 5. Cut the peel off the oranges, and then slice into rounds and cut each round into a few pieces. Toss with a little flour (this gets messy! ), and then place on top of the batter – they’ll sink in, and that’s perfectly fine. 6. Bake about 45 minutes, until a tester in the middle comes out clean. Brush with Cointreau while still warm, and then let cool before frosting. 7. Make the frosting. Melt both chocolates together, and let cool to room temperature. Add the butter and Cointreau, and beat until fluffy. Frost the cake. Disclosure: I received a free copy of this cookbook for review purposes, but all opinions are my own. Mark Bittman has a new cookbook out about his eating philosophy, Vegan Before 6. Now, I have to be honest, I find Bittman to be more than a little annoying at times. I think he's spent so much of his life centered around food writing and the food industry that he doesn't really 'get' normal people. For example, in the section on recommendations for people who don't like to cook, his advice is to just spend an hour a day cooking in the kitchen. Hm. Well, I love to cook, and I don't even spend that much time in the kitchen every single day. For most people, it is simply not realistic, and it's certainly not necessary for a healthy diet! I honestly also find the whole obsession with veganism being equated with healthy eating to be off-putting. For some people, that may be what works for them (and more power to them!). But, I completely fail to see how a chicken breast, a piece of salmon, and some low fat milk in your coffee are not completely healthy options for everyone else. Okay, rant over! That said, VB6 does have some tasty, healthy, and easy recipes in it, so it's worth having for that aspect. 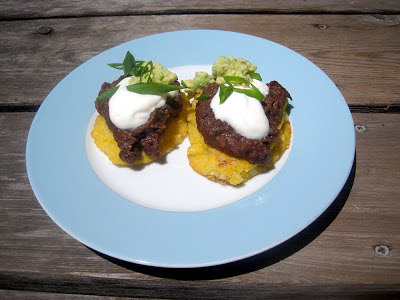 These corn cakes are a great example. The cakes themselves are vegan, and you can dress them up with any Mexican toppings you like - or, some fresh fruit and yogurt would be great as well for a sweet option. I was impressed at how well the corn cakes held together without any egg to bind them, and I loved the bits of fresh corn in the cakes to keep things interesting. We had this dish for brunch, but depending on the toppings you use, I think this could work for pretty much any meal. 1. Heat the oven to warm (or whatever the lowest setting is). 2. Combine the polenta, corn flour, baking powder, and salt in a medium bowl. Gradually whisk in 1-1/2 cups of boiling water. Let the mixture sit until the cornmeal absorbs the water, 5-10 minutes. Stir in the oil and more boiling water, until the mixture forms a loose batter (I used about 1/2 cup more, your mileage may vary). Stir in the corn. 3. Put a large non-stick skillet over medium-high heat. When the pan is hot, spray with a little oil. Working in batches, spoon the batter into the pan. When the bottoms are brown, carefully flip (the cakes are somewhat fragile). After the second side is browned, transfer to a plate and stash in the oven until all the cakes are cooked. 4. Serve topped with refried beans, sour cream, avocado, and green onions - or your favorite Mexican toppings. Last week, I promised a recipe for mint pesto in my post on fresh mint ice cream - and here it is! I recently got the new River Cottage Veg cookbook, and was totally wowed - so many fantastic veggie-based recipes to choose from! Everything here looks fresh, delicious, and full of flavor. Since we'd gotten two big bunches of mint in our CSA, I knew the first thing I made would involve mint. I totally fell in love with the recipe for vegan mint pesto. I'm generally not a huge pesto fan - it's okay, but not my favorite. Switching out the basil for mint and the pine nuts (so expensive!) for almonds really makes this sauce a winner for me. Because there's no cheese in the pesto, it keeps longer in the fridge and also combines well with dishes that do have cheese in them without clashing. 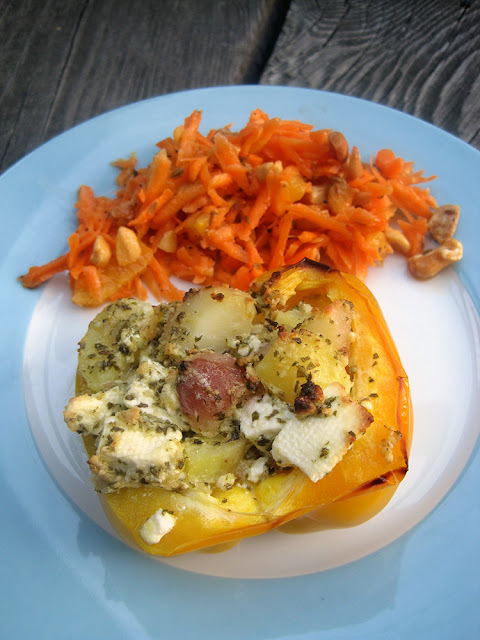 Here, the pesto is combined with boiled new potatoes and feta cheese, and then stuffed inside bell peppers for a totally delicious vegetarian main. The stuffed peppers really felt special - I could definitely see making them for a holiday or other special occasion when you want to make sure vegetarians don't feel left out. I will say that the amount of feta cheese in the filling is high - it's about a 1:1 ratio of potatoes to feta, and I think next time I probably aim for twice as many potatoes as feta. Either way, because feta plays a starring role here, you'll want to make sure you get a good quality, fresh feta - not the kind that is pre-crumbled in a plastic tub. Alongside the stuffed peppers is a fantastic carrot salad. You all know that I love my carrot salads - they're so easy to make, and leftovers keep way longer than green salads. This particular carrot salad is a great one - orange segments make it a little sweet, while cumin seeds add a smoky note and cashews provide a nutty crunch. Definitely a winner! 1. Make the pesto. Put the almonds, mint, garlic, and lemon zest in the food processor. Pulse until finely chopped. Add the mustard and sugar, and pulse a few times. With the motor running, stream in the olive oil to create a thick puree. Squeeze in the lemon juice, and season with salt and pepper. Taste and adjust seasoning. 2. Bring a large pot of salted water to a boil. Add the potatoes and boil for 8-12 minutes, until tender. Drain and let cool. 4. Halve the peppers and remove the seeds and ribs. Rub the outsides with oil, and then place in a roasting pan. 5. Halve or quarter the potatoes, and place in a bowl. Cut the feta into 1/2 inch cubes and add to the potatoes. Add about half the pesto and toss until well-combined. Add more pesto until you get the consistency you like. Taste, and adjust for salt and pepper. 6. Spoon the filling into the peppers. Bake 40-45 minutes. (If the tops look like they're getting too brown before the peppers are fully roasted, cover with tin foil.) Serve hot. 1. Toast the cashews in a hot, dry skillet until they just begin to brown. Add the cumin seeds, and toast for a minute more, until fragrant. Transfer to a plate to cool. 2. Place the orange segments and and orange juice in a large bowl. Grate the carrots using a large-holed grater, and add them to the bowl with the oranges. Splash in a little oil, season with salt and pepper, and stir to combine. 3. Add the cashews and cumin, and toss again. Taste and adjust for seasoning. I am a huge fan of meatballs, and these were no exception. Rather than the usual pairing with spaghetti, these meatballs are big enough to stand on their own with some crusty bread on the side. 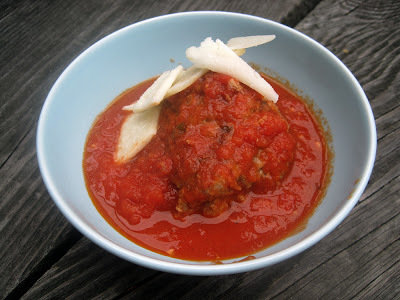 The whole dish sort of reminded me of deconstructed meatball subs - so much fun! Although these meatballs were really delicious, making them was kind of a pain. The meatballs really are giant - 1/4 pound each, or the size of a hamburger. I initially thought this would make them easy - less meatballs to roll - but it turns out that giant meatballs don't really like to hold their shape in a frying pan! This particular meatball mixture is pretty wet - and while this meant the final meatballs were moist and not-at-all dried out, they also ended up pretty misshapen! These were good enough to make again, but next time I would use less liquid, and would also use a lower temperature to brown the meat - they were tricky to get in the pan and flip, and burned easily, so there wasn't a lot of time to fuss around with them. A firmer meat mixture and lower temperature should solve both of these problems. Despite the fact that the meatballs ended up sort of flattened and some of them got a bit burned, they were still super tasty! They combined really well with the simple homemade marinara, and were perfect with crusty bread from our local student co-op. The leftovers held up well, so I recommend making extras so you have some for lunch or dinner the next day. 1. Make the sauce. Heat a large pot over medium heat and add the oil. When the oil is hot, add the shallots and garlic, and cook until lightly browned, 2-3 minutes. Add the thyme and the white wine and let reduce for a minute or so. 2. Add the tomatoes, crushing them up as you go. Bring to a simmer, and then reduce the heat to medium-low. Simmer, uncovered, for about 25 minutes, stirring occasionally. Remove the thyme, and puree the tomatoes with a stick blender if you want a smoother sauce. Stir in the basil and season with salt and pepper. 3. While the sauce simmers, make the meatballs. Combine the bread and milk in a large bowl, and let sit for five minutes. Mush up the bread with your hands, and then add the shallots, garlic, parsley, thyme, mustard, salt, paprika, and egg. Mix until everything is well combined. Add the ground meats, and gently mix with your hands until everything is combined. Form into 8 large meatballs. 4. Heat a large, heavy skillet over medium heat. Add the oil. When it's hot, add the meatballs (working in batches - I could fit in 4 meatballs at a time) and cook, turning occasionally, for about 12 minutes, or until browned all over. Use a slotted spoon to transfer to a paper towel-lined plate to drain off any excess oil. 5. When the sauce is ready, add the meatballs and simmer for 10-15 minutes, until cooked through. 6. Spoon the meatballs and sauce into serving bowls, top with cheese, and serve hot. We got two huge bunches of mint in our CSA, and I knew right away that I wanted to make mint ice cream with some of it (the rest went into a fantastic mint pesto, which I'll post soon!). I sort of messed up this recipe, in that I didn't read down to see that after cooking the custard, you were supposed to add 1-1/2 cups heavy cream...so I just poured in the remaining 1/2 cup half-and-half that I had in the fridge, and called it a day. I was a little worried, but luckily the ice cream was still really rich and delicious. If you want the real Alice Waters deal, you can go ahead and add 1-1/2 cups of heavy cream in place of the 1/2 cup of half-and-half in step 4. Either way, this ice cream has a really interesting flavor. Fresh mint is delicious and so different than the peppermint extract you find in regular mint ice cream. 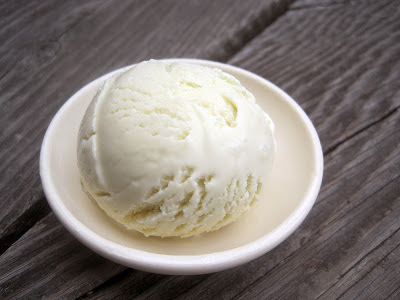 I loved the herbaceous, minty flavor - definitely something you won't find at the grocery, which to me is a big plus of making your own ice cream at home! We enjoyed this with a simple vanilla cake. 1. Place the yolks in a medium heat-proof bowl and whisk to break them up a bit. 2. Combine 1-1/2 cups of the half-and-half with the sugar and mint in a large saucepan. Warm over medium heat until the cream begins to steam and small bubbles form at the edges - don't let it come to a full boil. Remove from heat and let sit for 10-15 minutes. Pour the mixture through a fine mesh strainer and press on the mint to extract as much cream as possible. Return to the stove, and reheat until steaming. 3. Pour the hot cream into the yolks in a slow stream, whisking constantly. Scrape back into the pot and cook over low heat, stirring constantly, until the mixture coats the back of a spoon (1-2 minutes). 4. Strain the mixture into a clean bowl. Whisk in the remaining 1/2 cup half-and-half. Cover, and chill at least 4 hours, until very cold. 5. Freeze in an ice cream maker according to the directions on your ice cream maker. 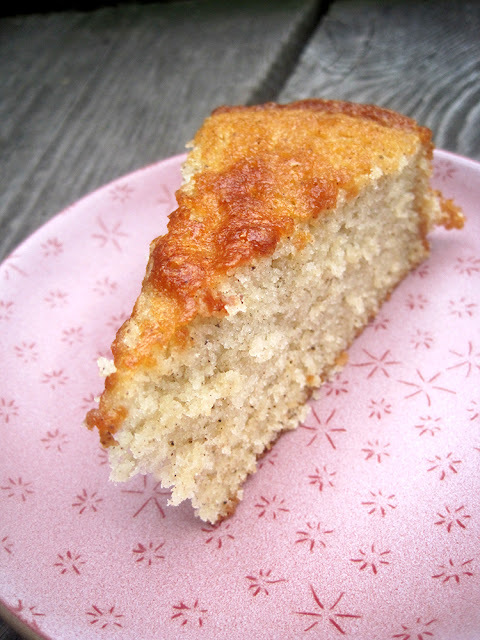 This simple cake is delicious and hits all those 'comfort food' buttons - I think it tastes an awful lot like a less-artificial, homemade version of boxed white cake! The technique here is interesting - the dry ingredients are creamed into the butter and oil until a dry, sandy mixture forms, and then milk and egg whites are beat in until a smooth, silky batter forms. I'm no expert, but I think this creates a more tender crumb because the fat coats the flour and prevents the gluten from becoming too tough. You can certainly use vanilla extract here for a whiter cake, but I really like the flecks of vanilla from using ground vanilla or the seeds from whole beans - it reminds me of vanilla bean ice cream! I found this cake to be sweet enough that it didn't need any frosting, but it was excellent with a scoop of ice cream - I'll post my recipe for fresh mint ice cream later this week! 1. Preheat oven to 350. Grease a 9-inch round springform pan. 2. Combine the milk, egg whites, and vanilla in a small bowl with a fork. Set aside. 3. Combine the flour, sugar, cornstarch, baking powder, and salt in an electric mixer and mix on low speed until combined. Add the butter and oil and mix on low speed until the mixture forms sandy clumps. 4. Add all but 1/2 cup of the milk mixture and beat at medium-high speed for 1-1/2 minutes. Add the remaining milk, and beat for an additional 30 seconds. 5. Scrape the batter into the springform pan. Bake 40-50 minutes, until a tester comes out clean. Let cool before serving. My partner for this month's Secret Recipe Club was Elizabeth of Food Ramblings. I was initially tempted by some of the delicious dessert recipes on Elizabeth's blog, especially her peanut butter-Nutella swirl cookies and her oatmeal-topped peach cobbler. But, those both had to wait once I saw this recipe for creamy chicken lasagna - I just had to make it! 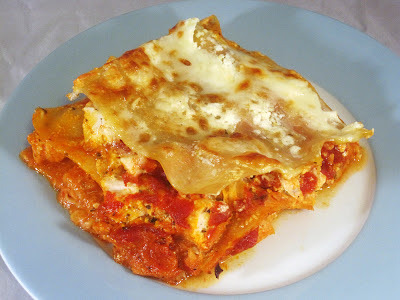 I am a huge lasagna fan, as you can see from all the different ones I've posted here: ratatouille, spinach-artichoke, butternut squash-goat cheese, roasted red pepper, hearty meat, and Emilia-Romagna! This one is a great addition to that collection. It's super flavorful, and Tim and I both gave it two big thumbs up. Low fat cream cheese makes for a surprisingly creamy lasagna, while marinara sauce keeps it from feeling too rich. I love the use of chicken - it's not your typical lasagna ingredient, but it really works here and is easier to prepare than most meat sauces. If you prefer a vegetarian dish, the chicken could easily be replaced by some roasted veggies or sauteed greens. Definitely a winner - thanks, Elizabeth! 1. Bring a large pot of salted water to a boil. Add the chicken, and return to a boil. Reduce heat to a simmer, and cook 3 minutes. Then cover the pot, remove from heat, and let sit 18 minutes, flipping halfway through. Check to make sure the chicken is cooked through, and then allow to cool. 2. Preheat the oven to 400 degrees and spray a 9x13 baking pan with oil. Set aside. 3. Chop the chicken into small cubes. In a medium bowl, whisk together the dried basil, 6 ounces of the Neufchatel, and 1/4 cup of the broth. Add the chicken to the Neufchatel mixture, and stir gently to combine. 4. In another bowl, whisk together the remaining 2 ounces Neufchatel and 1/4 cup broth. 6. Spray a large piece of foil with oil, and cover the lasagna, oil-side-down. Bake 45 minutes. 8. Let sit for about 10 minutes before cutting and serving. This delicious cake can just as easily appear on a dessert plate or as part of a decadent breakfast spread. To me, it's the equivalent of a cleaning-out-the-fridge pasta sauce or frittata, but for baking. Obviously, what you have to use up in the kitchen may vary from me, but in my case, I had a couple of apples and a couple of oranges on their last legs, a jar of sour cherry jam that was getting a little long in the tooth, and a bag of dried cranberries in the cupboard to round things out. These ingredients bake up into a moist, spicy cake that's full of fruit and flavor. 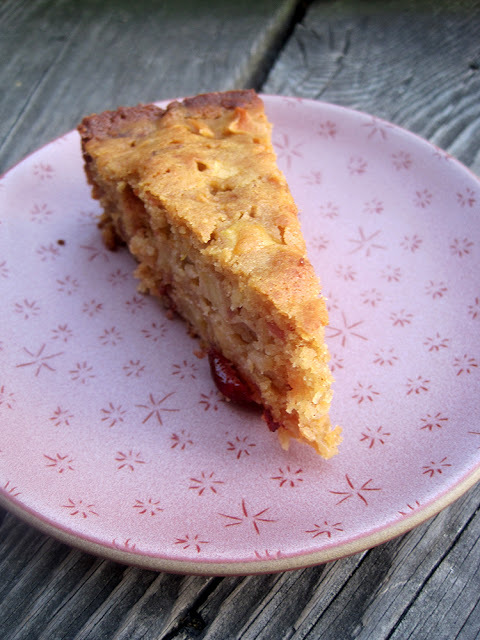 I really like that the cake isn't 100% sweet - the tart cranberries, bits of sour cherry from the jam, and slightly bitter orange zest add different dimensions of flavor that really make this cake interesting. 1. Preheat the oven to 325 degrees and grease a 9-inch round springform pan. 2. Beat together the butter and sugar until light and fluffy. 3. In a small bowl, lightly beat the eggs with a fork. Gradually beat the eggs into the butter-sugar mixture until combined - the batter may look curdled, but that's okay - it will all come together later. 4. Whisk together the flour, baking powder, cinnamon, and salt. Using a rubber spatula or wooden spoon, fold into the wet ingredients until almost completely combined. 5. In a medium bowl, stir together the apples, cranberries, jam, and orange zest until well combined. Then, fold the fruit into the batter until evenly distributed. 6. Scrape the batter into the prepared pan. Bake for 70-75 minutes, or until a tester comes out moist but clean. Cool before serving.